When you need a reliable solution that provides comfort and support with a pleasing appearance, our suede latex foam chair pad has it all! Made with 100 percent pincore latex, this is a hypoallergenic option which adds to the peace of mind. Our Dunlop latex foam is anti-microbial naturally and provides excellent comfort while staying well ventilated, making it great for relieving pressure and circulation issues or just overall comfort. Our latex chair pads have a balanced, medium-firm feel which offers the right balance of support and softness for your needs. With the zippered passion suede cover, the appearance is pleasing and adds an extra level of softness to the pad. 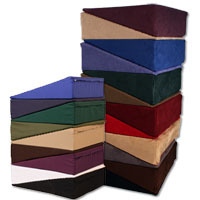 This latex foam chair pad comes standard with a removable passion suede cover which is included and available in your choice of 12 vibrant colors! The cover is machine washable on delicate cycles for added ease of care. When you need a reliable solution that provides lasting comfort with a great style aspect, this suede latex foam chair pad is the perfect choice for you! NOTE: Only the removable cover is machine washable; latex cannot be laundered. Standard Size: 19" x 19" x 2"
If you have any questions while shopping any of our high-quality selections, please contact us for further assistance on the matter today.